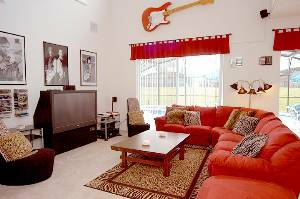 Live the "AMERICAN DREAM" in our HOLLYWOOD ROCK 'n ROLL themed Home! Do you love Films and Rock music? Congratulations! You’ve discovered one of the most unusual luxury vacation homes anywhere. Our theme is "The American Dream" and we've tastefully decorated to celebrate our favourite icons, from Heroes of Rock 'n Roll to Hollywood Stars. 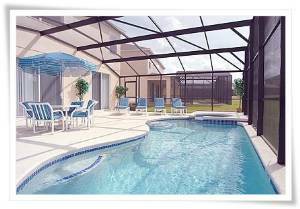 7 bedrooms (sleeps 16) 4.5 bathrooms, South facing (sunny all day) with private Heated Pool and Jacuzzi, at the award winning Emerald Island Gated Resort, Kissimmee. With over 4,200 square feet (including extended deck) and plenty of loungers and shades for sun worshippers, we've put TVs and DVDs in all the bedrooms. We have Full Air Conditioning, including the Games room where children of all ages will enjoy Air Hockey, Foosball, Table Tennis, PS2 etc. Take full advantage of free International calls to phone home and tell your friends what a great time you’re having! We have Cable TV, a vast open plan Family Room with 55" TV, DVD and Surround Sound (sounds awesome!) plus a library of over 100 DVD and Blu-Ray discs. Free Internet Broadband too – just bring your WiFi enabled laptop. All linen and towels are provided and in the Laundry room you’ll find a Washer, Dryer, Hair Dryers and Ironing facilities. Each bedroom has it’s own unique theme, and includes two private Master en-suites with their own 40” Flatscreen Internet TV so you can surf the net from the comfort of your own bed – very cool! And for our youngest guests we have 2 Strollers, 2 Highchairs, 2 Portable Cribs, stair safety gates, intercom and patio door Pool safety alarms. You'll love the extensively equipped Kitchen with its' own intimate Nook area (which usually turns into a social gathering place as well as an eating area) where you can watch the underwater pool light at night – Magical! Dine in style in the formal Dining area, eat "al fresco" round the Pool or just enjoy a well earned glass of wine in the heated Jacuzzi at midnight while you plan the next days’ outings. And after all the excitement of the day if you prefer some peace and quiet, just head for the privacy of the cosy lounge at the front of the house, away from all the action. You'll find amazing original portraits, a unique mural, fascinating pictures and incredible giant sculptures throughout the home. Finally, we’re pleased to say that our low season rates apply for a full 8 months of the year - basically all the time except for Summer, Xmas / New Year, Easter & Thanksgiving! Is this the most fun and unusual vacation home you could ever stay in? very much, and Hope to come back once. This amazing home made our Disney vacation even more memorable! The uniquely decorated house had plenty of living space and beds for the 13 of us! Never felt crowded. 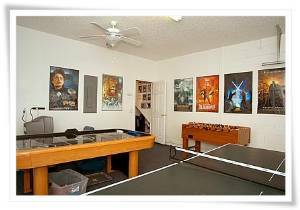 The property is very well maintained and the pool and game-room were a huge hit! We were literally minutes down the road from the Disney Parks. I hope we can get back there very soon!!! Thanks so much to Mark and Debbie! You're the best! Thank you for letting us stay at your home. The house had everything we were looking for, location, pool,and great neighborhood. We would highly recommend your home. Beautiful home with lots of amenities and very close to disney. We had a wonderful time and everything was as described! The pack and plays and high chairs really helped out- one last thing to try and bring on the flight! A fantastic house with many wonderful features. Very close to Disney. The homeowners are great are quick to respond. I have stayed in the house twice in the last year and would love to stay again in the future. Great proximity to Disney. Well maintained property. Kids loved the decor and playroom. Parents loved the space. Very responsive owners. The house is amazing !! really big and well maintained ! !.....everyone of our party of 15 loved the house and was comfortable....it's close to everything and will stay there again if in the region of Orlando !! A beautiful and unusually interesting home. Plenty to do and loads of space for the 8 of us. Rock and Roll memorabilia is amazing. Just a pity we were only there for a short time. Would recommend to anyone!! We all had a great time! The house was perfect. Even with 15 people we felt like we all had privacy. The kids loved the pool after being at Disney all day. We were close to everything and had no problem navigating our way to and from the parks. We all hope to make it back some day! Thank you Mark & Debbie!! Best vacation ever! The house made all the difference. Plenty of room for a party of 15. The kids enjoyed the pool and game room which allowed the adults time to visit. 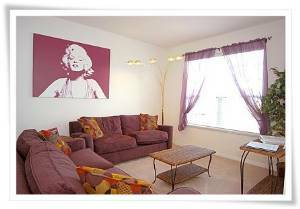 Easy access to Disney, Sea World and shopping. We'll definately come back. Thanks Mark and Debbie for sharing your house, it was a pleasure working with both of you. Fantastic House. Perfect location and ideal for our party of 11. Loads of space for the kids and they loved the pool and games room. Would highly recommend it to anyone. We had a great time during our stay. The house is great with plenty of room for our group of 8 adults and 9 children. The location is excellent, this is our second time staying in Emerald Isle. Communication from Mark and Debbie was excellent leading up to our stay and right after our return. Many thanks for sharing your house with us. House was excellent and also location was great for us. Our group consists 18 people and still enough room for all of us. Absolutely brilliant !!! 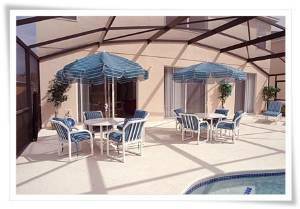 The Villa is amazing and Emerald Island Resort is perfectly situated 10 mins from Disney ! The Villa had everything we needed and much more !! Thanks again Mark.... not just for the Villa, but the communication leading up to our stay and during was first class!!! We will be back !!! The house was perfect. Even with 15 people we did not feel crowded. The kids loved the gameroom, and the adults loved the spaciousness of the home. Only 10 minutes from Disney and 5 minutes for food shopping. We will definitely rent from Mark again!!! We had such a nice stay at the rock n roll home. Being old rockers ourselves, it screamed RENT ME!!! We had a wonderful time in your beautiful house. The ameneties were wonderful. Our children especially loved the game room,cable tv in their bedrooms and pool. We had plenty of room to spread out after a long day at the parks. Thanks again for your prompt responses to all of my questions. We will stay again! Our family had a GREAT time at your home. We had 15 of us which included 9 children. The kids loved the game room and especially loved the pool! The house was just perfect for all of us and in a great location- Disney, groceries, restaurants were all close. It was a wonderful vacation at a wonderful home! Had a fantastic time. Great floor plan with lots of room for our kids and family. Garage has lots of fun for kids with air hocky++. 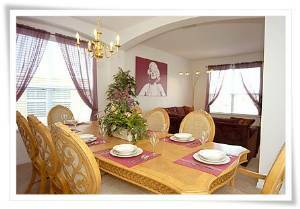 Excellent location for Disney, and gated community was nice and well managed, and quiet. Pool was warm and a hit w/ kids too. 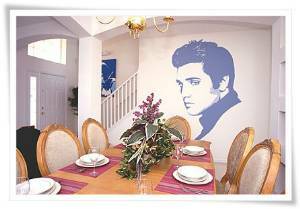 The rock'n'roll decor was fun with the various wall art of famous people. I would return and recommend this home. Our family and guests thoroughly enjoyed our stay in your wonderful home. Even though we live close by, we rented it for a "surprise" 50th birthday celebration. Our out-of-town guests were thrilled with the amenities (especially the heated pool and spa after a long day at the theme parks). The gated community was beautiful. We would definitely recommend your property. Also, having rented other VRBO properties over the years, I would like to add that it was a pleasure renting from Mark and his wife, both of whom were very friendly via phone and e-mail and quick to respond to any questions. We really enjoyed our stay in your very colorful and fun house. We had kids of all ages, they really found some fun things to do. I would recommend your house very highly. I hope we get the opportunity to use it again. This time however I will come down when it is cold up north. guarded resort. The location to Disney was wonderful. The pool was great and the kids enjoyed the play room so much. Really having this home to stay in was the icing on our trip to Diseny World. Mark & Debbie, thank you for sharing your house with the world. It was clean, entertaining and roomy. The pool was the icing on the cake! It took only 7 min to get to the parks. We will be back, Thank you again, you helped me make my sister's 40th special. We really enjoyed our stay. There were 15 of us and the size of the house was great! The kids enjoyed the pool and the game room a lot! We would recommend this house to anyone traveling with a large group. Also the location was great! Close to Disney and other shopping. What a great house! 12 of us stayed there and there was plenty of room for everyone. We used the pool everyday and had so much fun! I would definitely recommend this awesome house! We stayed in the Rock 'n' Roll house the first week of April, 2008. Two families shared the home. We had a fabulous week! The home was plenty big enough for 4 adults and 4 teenagers. The teenage boys were able to have their own bedrooms and TVs, and the teenage girls chose to share a room (the diva room, of course). There were still two bedrooms left unused! We enjoyed the pool, the gameroom and watching movies on the surround sound TV. The house was in a nice location. The neighborhood was pretty and nice for a morning walk or run. It was just a short drive to each of the parks. The grocery and many restaurants were also closeby. The owners, Mark and Debbie, were very easy to work with. I was hesitant renting from someone in another country, but it really wasn't an issue. All my emails were answered immediately, and there was a manager nearby to handle any problems while we were there. The house is awesome. When we weren't at the parks I couldn't drag my husband away from the Beetles, Queen, Who DVDs. You truly tapped into his interest. The kids loved the game room. I was told the clubhouse was good too. We enjoyed the uniqueness of your home. We have rented a lot of homes in Florida. Yours was the best. Family trip that included persons from 8 months to 74 years old. The house was conveniently located,very clean, had something for everyone with the spa, pool and game room. The decor was fantastic with the themed rooms. So much better than any of the other generically decorated rental homes that we have stayed in in the past. Everyone in my family thought best house ever. I hope to be able to go back there again. We had a great time at your fantastic home. There were 6 adults and 5 kids traveling in our party and the home worked out great. The house is so close to all the Disney parks that we were able to visit a park in the AM, come home for lunch, take a nap or a swim for downtime and then go visit another park in the late afternoon. I will highly recommend your home to anyone who is traveling to Disney World and look forward to visiting again sometime in the future. What a fantastic place! We had 16 people in our party - 11 adults and 5 children. Every bedroom was full. And we still had plenty of room. The house was a comfortable haven after a busy day at the Disney Theme Parks. It had everything we needed and more. The children loved the game room. The teenagers loved the video games and DVD's on hand. We all loved the pool and especially the jacuzzi after a long day of walking at Disney. Everything was close by - shopping, restaurants, grocery store. It was an absolute pleasure doing business with Mark and Debbie. I will highly recommend this place to all our friends. shopping were all only minutes away. Great place! Plenty to do and everything is nearby. Many golf courses to choose from. The home exceeded all expectations. Very clean, and nicely furnished. This house was just fantastic! I was a little nervous about reserving a house on line but it was everything that the website advertised and more. The house is spotless and in excellent condition. The pool and hot tub are wonderful. The location is very close to Disney World and Universal and there are grocery stores and restaurants right down the street from the house. The house is huge and more than enough room for the five of us. With teenagers, it was great to spread out! I was supposed to stay in a hotel for a conference and I'm so glad I rented this house instead. Very relaxing, quiet and safe. A wonderful retreat after a day at the theme parks. 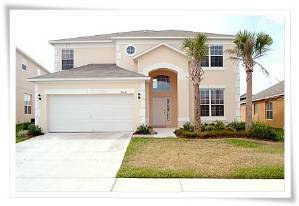 We would definitely rent this house again and I am recommending it to anyone I know that is heading to Orlando! What a fabulous place and the most wonderful host/hostess! This house is pristine and has everything you need! We are a family of 7 and we had many quests that were local come over to join us in a week long sleep over party! Just 2 miles from Disney's doors and everything you want at your finger tips! Cooked in and ate out too! Swimming in the delicious and clean pool under the moon and stars, playing games provided in the house and watching the current movies on the wide screen and playing ping=pong and air hockey - made this a vacation that was fun, exciting and most memorable for all of us! The neighborhood is beautiful and quiet, wish we had the time to walk the nature walk or use the playgrounds and shared pool/clubhouse - it was so inviting! Novel decor made the atmosphere truly unique! Sit back, watch a movie, cook w/your kids, swim under the stars and enjoy a clean home away from home! Perfect setting for a family Enjoyed everything from hot tub to games room to convenience to attractions Highly recommend! We really enjoyed our stay in your lovely home. The kids loved the game room! The decor was a refreshing change from the normal condo decor. Thank you again for allowing us to use your home while in Orlando. This has got to be the most unique, fun house you could ever stay in at Disney! We had a wonderful week with no hassles, problems, or anything negative! The home has everything you can imagine to make your stay go smoothly. And of course, the decorating is the most imaginative, fascinating we had ever seen. The kids LOVED it!! All they could say was "cool"!! Over and over again! The house was incredible! It had everything we needed and was a fun, unique place to stay. The "Before They Were Stars" wall was great. Take it from us...Floridians who have stayed at most of the Disney World Hotels...The best place to experience Orlando is the American Dream Home! Why stay in a small room when you can have a large beautiful home all to yourselves? Everything you could hope for is right at your finger tips.The House is so spacious and beautifully decorated. We really enjoyed the gameroom and pool area too! Our teenage daugthers LOVED the Rock and Roll theme. (David Bowie Rocks) The artwork and furnishings are truly one of a kind. Following the Rock Music theme we had a great time watching music videos and took the short drive to Universal's City Walk and had dinner at The Rock Cafe. Thank you Mark & Debbie for sharing your Dream Home with us! A delightful holiday made very enjoyable by a luxurious "American Dream" home. The pool, hot tub and large terrace were used a great deal during our stay.Being within easy reach of some of the attractions was an added bonus. A beautiful home, one to be recommended to those seeking unusual and comfortable accommodation. Loved the whole experience in the American dream home. Family had great fun identifying the many star pictures. Games room is great for the kids and the pool and hot tub were real luxury after a day at the parks. Well done on providing such a wonderful luxury family enviroment to complement the rest of the Orlando holiday experience. We will certainly be coming again. Not our first time in Orlando but our first time in a vacation Villa. American Dream Home certainly surpassed our expectations. Not only was the property large, well equipped for all ages and amazingly close to all the major attractions it had that WOW factor. Mark and Debbie have achieved that wonderful combination of making you feel at home and yet providing all the luxuries you need to make a holiday memorabale. We had a wonderful time living the “American Dream” during our recent stay in Orlando. I had taken several of my graduate students to a conference that was held at a Disney hotel. My family (husband, 1 year old, 3 year old, grandma, and great-aunt) tagged along for the theme parks, of course. We were all quite comfortable in the spacious and well-appointed home. The owners have done a great job of providing quality linens (with plenty of towels) and furnishing, as well as anticipating needs/desires. There is a collection of DVD’s, plenty of furniture by the wonderfully relaxing pool and spa, a well equipped game room in the garage, and all the necessary essentials for traveling with little ones (high chair, child safety gates, electrical plug covers, pack-n-play, baby monitor). My students had a tournament one night in the game room and we had some good “bonding time”. There was also plenty of common space in the home so that the students didn’t have to spend time with my family if they elected. The home was very convenient to Disney and in fact I’m pretty confident the commute time to the parks was less than it would have been from the Disney hotels. I took the Disney transportation twice from the conference hotel to the theme parks and both times it took me better than 1 hour 15 minutes to get to the parks. The drive, on the other hand, was less than 10 minutes. I would definitely recommend the “American Dream” to others and I’ll look to stay there again should I return to Orlando. Thanks for sharing your home! What a fantastic experience. This house has real star quality. The furnishings were completely sumptuous and made us both feel a like we were really living the movie star life. On a practical note, the house offered everything to a very high standard with an incredibly well equipped kitchen, laundry room, even a games room which I'm not ashamed to say we adults monopolised! We can honestly say that there was nothing we wanted for. This was what a holiday should truly be, great booking service, fantastic accommodation and an overall brilliant experience. I would highly recommend it. Having spent a week staying at the "American Dream" I have to say I would thoroughly recommend it to all. The interior is beautifully and originally decorated, very well equipped but above all great fun. The Hollywood/rock star theme works really well, and went down particularly well with my teenage children and friends, who found the whole environment very "cool". very enjoyable holiday location. Well done Mark and Debbie. What an amaxing house! As you go in the door you immediately start to see the woderful paintings of your favourite Hollywood Stars, and as you tour round this very large property each room is an experience in itself. The furnishings are lovely and comfortable and the huge TV with incredible surround sound makes an evening in an absolute pleasure. As if this weren't enough we found that even the kids had been considered with the double garage having been expertly converted into a games room. We hardly saw them once they'd found it! This is no ordinary home and I'd recommend it to anyone. The complete experience was an extraordinary thrill! The whole occasion, from the time I began my search and met Mark on-line, until the time we had to say goodbye to the Dream Home, was just fantastic. This being my first venture into securing a place in Florida, I was a little apprehensive. Mark and Debbie, with their prompt follow-ups and friendliness, quickly eased my mind. Then, not being the first couple to arrive at the Dream Home, I still knew I was in for a treat when I received phone calls, at the airport, from two other couples telling me how great the house was. I just couldn’t wait to get there. From the beautiful pool and spa, to the extremely comfortable furnishings throughout the house, you get that sense that WOW, am I glad to be here! It’s a real charm, when you can sit down to eat with Elvis, or enjoy a book with Marilyn. And the kids loved all the entertainment features. My family stayed an extra day in a hotel around Disney. We all got up the next morning complaining of backaches. Then we all agreed, Mark and Debbie’s American Dream Home was the best place we’ve ever stayed. We will certainly recommend it to our friends and family. If we ever go back to Orlando, the American Dream Home will be the first place we will look at. 7 day minimum stay. In Low Season a 4 day minimum is OK. Usually book Saturday to Saturday. Deposit: A deposit of $500 is due immediately when you book, and your reservation is not confirmed until we receive this. The balance is due at least 12 weeks prior to your arrival date.